Bermuda is moving through a period of economic stimulation. There are many projects that are ongoing or are about to commence which promise to revitalize the economy through the creation of jobs. It was this Government’s promise to rebuild our island economy and bring jobs and careers back to our home. We are doing that and those opportunities are now available. Not only are employment opportunities becoming available through these projects, many residents from east to west are benefitting from rental income from contract workers who are now residing in Bermuda. The AC35 project has provided hundreds of jobs in construction and reconstruction. The amount of work that has taken place in Dockyard is phenomenal. The majority of this work has been done with Bermudian companies. Hundreds of workers are building the AC village, renovating historic building, paving roads and so on. This global event has also created numerous entrepreneurial opportunities and jobs for Bermudians. Likewise, the Airport and the St George’s Hotel projects are now beginning to create hundreds of jobs. These two major projects promise to inject hundreds of millions of dollars into our economy. The Department of Workforce Development is in the process of assisting those unemployed or under employed to take advantage of these two great opportunities. If you find yourself or know of anyone in these categories, please contact them today. All Bermudian workers will one day be extremely proud to tell their children and grandchildren that they were a part of these significant projects. Additionally, the economic benefit to retailers in St Georges will continue with the added ferry lift from Dockyard to the Old Town. Further, the sixteen cruise ships that will visit St Georges this year will provide an economic windfall for retailers in the town. This undoubtedly will assist more Bermudians with finding employment in St Georges to cope with the added demand. The Ritz Carlton Reserve at Caroline Bay, The Loren, Surf Side, Coral Beach and Hamilton Princess are other projects that this Government has incentivized to move forward. 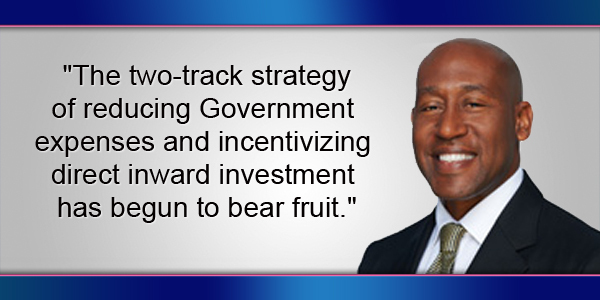 In an effort to create jobs we encouraged direct inward investment to assist moving Bermuda in a forward direction after years of decline and stagnation. This Government has successfully guided Bermuda out of the economic doldrums and continues to create opportunities for all Bermudians. The two-track strategy of reducing Government expenses and incentivizing direct inward investment has begun to bear fruit. The economic and social challenges that we faced in the early years of our administration were deep and complex. Because of this, we were not able to create the amount of employment opportunities and turn the economy around as quickly as we would have liked. However, we continued to push harder and harder to create an environment to increase job opportunities for Bermudians. Those opportunities are now here and it is my hope that Bermudians who are unemployed or underemployed will seek the many jobs that are now available. As we look into the near and long-term future, Bermuda still requires the guidance of leaders who are fiscally prudent and have a keen knowledge of how our economy works. There is also the requirement of leadership that will continue moving our island and our economy forward. This government has provided Bermuda with a life-line to continue moving our economy in the right direction. There is no doubt that under the previous government we were heading in the wrong direction with rising unemployment, rising crime and increased foreclosures on our homes. We had a mammoth task in front us and 4 years later, it is our belief that we have laid a solid foundation upon which we can build. What we will be asking whenever an election is called is that the OBA Government be provided an opportunity to continue on the path to move Bermuda forward. The Opposition wants to be elected with a platform called Vision 2025. This means that their ideas, goals and vision for Bermuda will take two terms in office to complete. Ultimately, you the voter will have to decide: do we continue moving forward to fiscal responsibility with the OBA or do we go backwards to fiscal mismanagement with the PLP? 18 Apr: Column: If Not Now, When? If Not Us, Who? 13 Apr: Column: To Be Frugal Or Not To Be Frugal? 19 Mar: Column: COI Report, Is Future More Important? I am still struggling to see what this gentleman brings to the table but I admit that as parrots go he is pretty good! I thought it had something to do with colors in the rainbow. I refuse to read something written by someone who should not be a member of the Government. Bermuda is clearly moving in the right direction now. Change always takes time but the writing is on the wall and optimism is in the air. Investment happens when the mood is positive. Our country depends on it…..and thank you for your untiring efforts. And just how many bills get paid by “optimism in the air” ? Those feeling good about what the OBA has done are those who have always had a head-start in this country. For the rest of us, these tired UBP policies of trickle down economics ain’t working. You are wrong on both counts. When my wife and I married in 1984, we had nothing. WE had jobs, but that is all. NO savings. WE have never inherited anything. WE are not rich, but we are comfortable. Your comment that only those who “have always had a head-start in this country” is simply wrong. You may hate the old families, but that does not make your assumption/statement correct. As for the economy, it is improving. Economies do not react quickly. typically, there is a 4 to 5 year lag between economic policy and economic impact. That means that changes made in 2012/13 will only now be showing results. I leave it to you to decide whether we were better off in 2012 or now. The proof is in the pudding as they say, and PLP’s pudding proved to be a failure. Why would anyone want to return to that?? I yet have to hear PLP’s platform. What are they going to do for me? They never have a sound, concrete argument, its always based on race. We’re tired of it…that’s not going to help the economy, immigration, social issues, etc. If anything they are a dividing party that’s toxic for this country. The OBA have things rock n rolling, why would I as a voter want to stop the gravy train? The Commission also found “a clear conflict of interest” for former civil servant, Vic Ball, now a One Bermuda Alliance senator, in the awarding of a $1.4 million contract in 2009 for sand and asphalt to Harmony Holdings — a company in which his father Eugene had a holding, which Vic Ball failed to declare. WOW really Vic you have a nerve to talk! Vic, you need to RESIGN! Your political life has NO FUTURE! You did not even show any remorse and saw nothing wrong with a conflict of interest. Still need to increase taxes as well. …but you are asking for two terms to complete (what you promised to do in one), so what is your point?